While my father was an only child and thus I had limited contact with relatives as I was growing up, my mother was one of five children and she believed it was important for me to develop a connection to family. Mother loved her family and that only grew with age. Whenever a card or note with pictures arrived in the male you could tell by the smile that came over her face. As we lived over 200 miles from most of her family, visits were limited to 3 or 4 times yearly trips to Toronto. As I child these were amazing times and much of the childhood memories I have today are of those trips. Be it by train, bus or when my dad drove down with us, these were great times for me. At the time it was the excitement of traveling from a small mining town to a big city with all the fun it had to offer. Today it’s the time I spend with my mother and especially my Grandfather George and Grandmother Hazel as well as the many aunts, uncles and cousins. While my grandfather died when I was 8, the memories I have are so vivid and special. Getting off the elevator of the apartment building they lived in their later years I can see him coming out of the door and yelling to me down the hall as I ran. I still read through the letters he sent me which have survived the years. My Grandmother was the archetype of what a grandmother should be. She always had a smile on her face and words of encouragement. I was always able to talk to her about things I would tell none else. As her health declined she never let on to me the obvious discomfort she was in. I will always remember the afternoon of my wedding day when Dianne and I dropped in to see her after a four hour drive from our home town. Grandma was past the point of travel but she loved the wedding cake we brought and the smile and words she shared that day will be with me always. To mother I will always be grateful for the sacrifices you made to ensure those memories were created. 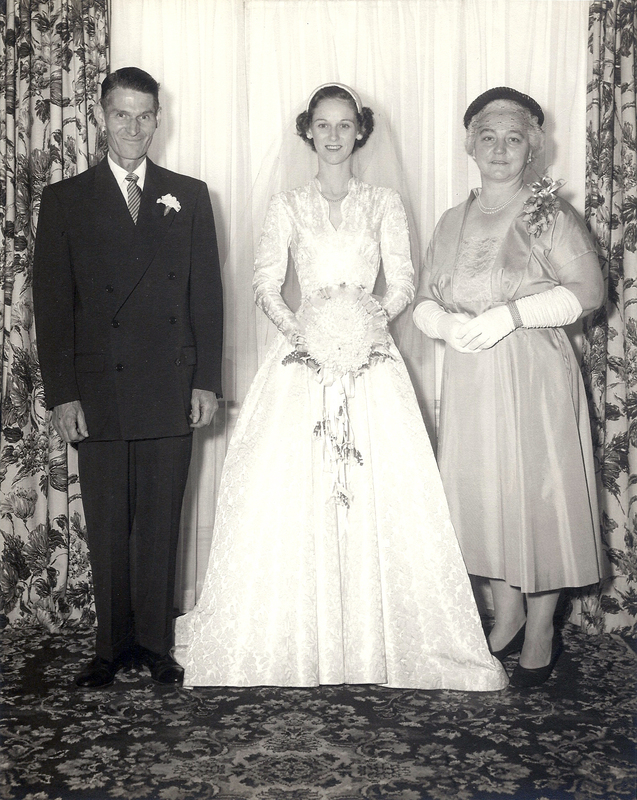 This entry was posted in 1950's, Bea Olivant, Uncategorized, Weddings and tagged Beatrice Olivant.